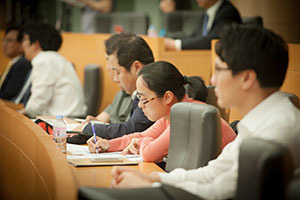 FMA connects you with 4,000+ international finance academicians and practitioners and provides resources to expand your knowledge and enhance your research, teaching and publishing. FMA offers doctoral candidates FREE electronic membership during the first three years of doctoral studies. Click here to join. Doctoral Student Consortia includes a panel session with distinguished scholars discussing the latest advances in research and offering career advice. The afternoon breakout sessions give participants the opportunity to present job market papers or dissertation proposals and receive feedback from the faculty and panelists. Accepted participants receive complimentary conference registration. For more information, click below. *Doctoral students may also submit papers to present at FMA conferences by participating in the general call for papers. Raghuram Rajan's "Are Capitalism and Democracy Failing Us?" Mike Jensen's "Beyond Agency Theory: The Hidden and Heretofore Inaccessible Power of Integrity"
Michael Weisbach's "What Topics are Hot & Why and How does the Journal Process Work?" Jay Ritter's "How to Write an Empirical Paper (and how to Referee One)"
Financial Management's Author Toolkit - NEW! Alex Butler's "The Academic Job Market in Finance: An Updated Rookie's Guide"
Krishnan's, Bathala's, Bhattacharya's, and Ritchey's "Teaching the Introductory Finance Course: What Can We Learn from Student Perceptions and Expectations?"